Cleans and ensures healthy hair and scalp! clēn is a gentle thorough cleansing shampoo that removes unwanted build up from the hair and scalp. clēn prepares the hair for perfect color when used prior to color application. With no oils or protein fillers, clēn reduces the weight of hair, creating a more natural volume while still providing a rich lather in the shower that leaves hair soft, shiny and manageable. Experience 24/7 healthy, shiny, soft hair when used as directed. Always follow up with slēk & cūr for optimal results. 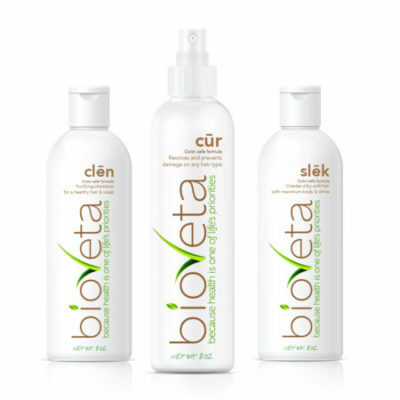 Bioveta clēn is a gentle and purifying, color-safe cleansing shampoo for the hair and scalp. It thoroughly removes hair product build-up, exfoliates and gives you a clean scalp. Massage a small amount of throughout the hair and rinse. Repeat and rinse thoroughly. Follow with slēk. After an exfoliating cleanse, maintain the moisture of your hair and improve elasticity.